The government will be continuing to pursue a proactive fiscal policy and a prudent monetary policy. This year's deficit-to-GDP ratio is projected to be 3 percent, with the fiscal deficit set at 2.38 trillion yuan ($345 billion), representing a year-on-year increase of 200 billion yuan ($29 billion). The projected deficit of the Central Government is 1.55 trillion yuan ($225 billion), and the projected deficit of local governments is 830 billion yuan ($120 billion). The M2 money supply and aggregate financing are forecasted to grow by around 12 percent in 2017. • Make progress while maintaining stable performance and keep its strategic focus. • Focus on supply-side structural reform. • Expand aggregate demand as appropriate and improve its efficacy. • Rely on innovation to replace old growth drivers with new ones and speed up structural improvement and upgrading. • Solve prominent problems of public concern. 1. Push ahead with the five priority tasks through reform. Solid and effective steps will be taken to cut overcapacity. This year, the government will further reduce steel production capacity by around 50 million metric tons and shut down at least 150 million metric tons of coal production facilities. It will also suspend, postpone construction of, or eliminate at least 50 million kilowatts of coal-fired power generation capacity. Targeted policies will be made to cut excess urban real estate inventory. The government will support both local and new residents in buying homes for personal use. It should be made clear that housing is for people to live in instead of reap investment returns. Deleveraging should be nurtured in an active and prudent way. While working to control overall leverage, the leverage of enterprises should be brought down. Multiple measures will be undertaken to cut costs. The government will abolish or suspend 35 administrative charges paid by enterprises to the Central Government, which represents more than a 50-percent reduction in the number. It then plans to reduce as far as possible those that still apply. Government-set operating fees for businesses will be reduced, and the government will continue to lower as appropriate the share paid by enterprises for contributions to social security. Lastly, this involves taking targeted and powerful measures to strengthen areas of weakness. This year the government will further reduce the number of rural residents living in poverty by over 10 million, including 3.4 million to be relocated from inhospitable areas. Central Government funding for poverty alleviation will be increased by over 30 percent. The government will continue to develop and transform its basic functions. The government will fully implement the list-based management system, formulate lists of powers and responsibilities of the departments under the State Council, and expand the piloting of granting market access based on a negative list. Fiscal and tax systems will be continually reformed. The government will simplify the structure of value-added tax rates, and turn the four tax brackets into three. It will step up efforts to make government budgets and final accounts more transparent. Another focus is advancing reforms in the financial sector. The government will prompt financial institutions to focus on their main business and make their services accessible to small and micro businesses, strengthen their ability to serve the wider economy, and stop them being distracted from their intended purpose. The government will speed up reform of state-owned enterprises (SOEs) and state capital. It will basically complete the introduction of corporate systems into SOEs. It will deepen reform to establish mixed ownership systems, and make substantive progress in industries such as electric power, petroleum, natural gas, railways, civil aviation, telecommunications, and defense. The energization of the non-public sector is another focus. The government will thoroughly implement the policies and measures for supporting the development of the non-public sector. It intends to quickly develop a new relationship between government and businesses. It will encourage non-public enterprises to participate in SOE reforms. The property rights protection system will be improved. The government will protect in accordance with law the property rights of economic entities under all forms of ownership and the property rights of citizens. Activities that infringe on the property rights of businesses must be investigated and dealt with severely. It will progress in its reform of the social system. The government will deepen reforms in support of change in the income distribution system. It will take steady steps to advance reform of the old-age insurance system, and allocate a portion of state capital to enlarge social security funds. It will deepen the coordinated reform of medical services, health insurance, and the medicine industry. It will continue reforms in education, the cultural sector, and public institutions to actualize society's vast potential for growth. The government aims to develop institutional reform, thereby building a sound ecological environment. The government will improve the functional zoning system and the mechanisms for compensating for ecological conservation efforts; it will put in place resource and environment monitoring and early-warning mechanisms. Also, it will launch trials to improve the state natural resource assets management system. It will introduce an overall plan for establishing a national parks system. The government is intent on promoting a steady increase in consumer spending. Firstly, the government needs to speed up the development of service consumption. Secondly, it needs to boost consumption of quality products. Thirdly, it needs to ensure order in the market. Expanding effective investment is another priority. The government will invest 800 billion yuan ($116 billion) in railway construction and 1.8 trillion yuan ($261 billion) in highway and waterway projects. Construction on another 15 major water conservancy projects will begin, and work will be quickly performed on major rail transport, civil aviation, and telecommunications infrastructure projects. A total of 507.6 billion yuan ($73.6 billion) of investment has been included in the Central Government budget this year. The planning for regional development will be improved. The government will boost the development of national-level new areas, development zones, and industrial parks through innovation. It will support the economic transformation and development of areas hurt by resource depletion and severe ecological degradation. Airspace resources will be better allocated. It will speed up the development of maritime economy demonstration zones. The government will take solid steps to pursue a new type of urbanization. At least 13 million new urban residents will be registered as permanent urban residents. The government will strengthen the capacity for making technological innovations. It will accelerate the development of emerging industries. Mobile rates for domestic roaming and long-distance calls will be cancelled. The government will endeavor to transform and upgrade traditional industries. It will intensify efforts to implement the Made in China 2025 initiative. It will continue to encourage people to start businesses and make innovations. It will take comprehensive steps to improve product quality. Structural adjustment in agriculture will be further developed. The government will increase the supply of quality rice and wheat, and make appropriate reductions to the amount of land devoted to growing corn. It will expand trials to replace grain crop with feed crop cultivation to cover over 667,000 hectares. Boosting the development of modern agriculture is another priority. The government will add 1.33 million hectares of farmland under highly water-efficient irrigation. In selected counties and county-level cities in 13 major grain-producing provinces, it will provide catastrophe insurance for farmers engaging in appropriately scaled farming operations. Rural reforms will continue to be improved. The government will take steady steps to reform the rural collective property rights system. It will support migrant workers in starting businesses in their hometowns and villages. The government will step up the development of public facilities in rural areas. A total of 200,000 km of roads will be upgraded or built in rural areas. Fiber-optic broadband will be extended to 30,000 administrative villages to increase the availability of the Internet. The government will make solid efforts to pursue the Silk Road Economic Belt and 21st-Century Maritime Silk Road Initiative. It will see that in holding the Belt and Road Forum for International Cooperation it offers an effective meeting. It will ensure that foreign trade continues to pick up and register steady growth. The government is making big moves to improve the environment for foreign investors. It will promote the liberalization and facilitation of international trade and investment. The government will make China's skies blue again. It will see that sulfur dioxide and nitrogen oxide emissions are both cut by 3 percent and that PM2.5--particulate matter with a diameter of 2.5 micrometers or less--density in key areas falls markedly. The government will strengthen the prevention and control of water and soil pollution. It intends for chemical oxygen demand and ammonia nitrogen emissions to both drop by 2 percent. The government will move forward with ecological conservation and improvement. More than 800,000 hectares of marginal farmland will be turned into forests or grassland. The government strives to boost employment and business startups. It will work to ensure that the people have access to equitable and quality education. The Modernizing Chinese Education 2030 initiative will be developed and launched. 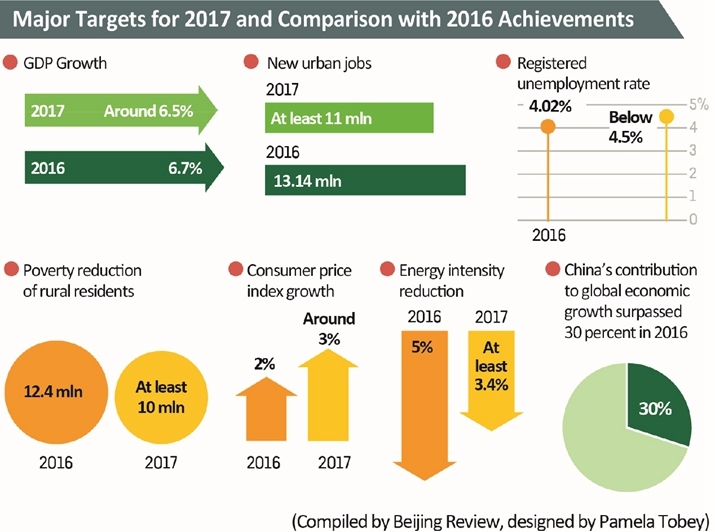 Continued progress in building a Healthy China is another key priority. The government will increase subsidies for basic health insurance for rural and nonworking urban residents from 420 ($61) to 450 yuan ($65) per person per annum. It plans to extend trials to use a tiered diagnosis and treatment model and a contracted family doctor service system to cover over 85 percent of prefectural-level cities in China. It will weave a strong safety net to ensure people's wellbeing. It will develop cultural programs and industries. It will create new forms of social governance. It will promote workplace safety. The government will continue to work to see that government functions are fully carried out in accordance with law. It will always maintain flawless ethical conduct and moral integrity. It will work with a strong work ethic, sense of responsibility, and enterprising spirit. • Managing religious affairs in accordance with law, and promoting harmonious relations between religions. • Implementing government policies related to overseas Chinese nationals. • Continuing to deepen reforms in national defense and the armed forces. • Continuing to implement, both to the letter and in spirit, the principle of "one country, two systems," under which the people of Hong Kong govern Hong Kong, the people of Macao govern Macao, and both regions enjoy a high degree of autonomy. The government will ensure that the principle of "one country, two systems" is steadfastly applied in Hong Kong and Macao without being bent or distorted. • Implementing the policies on work related to Taiwan, upholding the one-China principle, and safeguarding the 1992 Consensus as the common political foundation. The government will protect China's sovereignty and territorial integrity, maintain the peaceful growth of cross-Straits relations, and safeguard peace and stability in the Taiwan Straits. • Keeping to the path of peaceful development.